Have you got an award-winning walking bus? Top walk to school schemes will be among the projects honoured at the Green School Awards 2019 which are now open for entry. 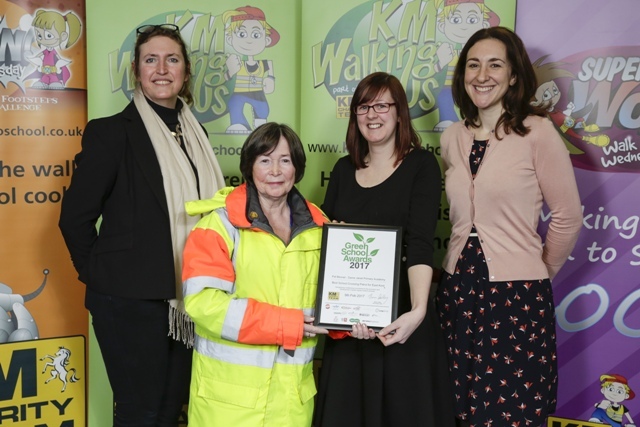 Organised by the KM Charity Team, the Green School Awards give eco-friendly Primary and Secondary schools the chance to shine - and set an example to other schools across the county. Green School Awards 2018 from Inspire Schools on Vimeo. Competition categories include the best use of walking buses and walk to school programmes. Even a much-loved school crossing patrol officer could gain recognition as a big thank you for keeping children safe. Anyone from the school can submit a nomination - teaching and non-teaching staff; volunteers, and parents - but the deadline to complete the online form is Friday 7 December. Winning schools will receive trophies and certificates to display as well as a Green School Awards logo to trumpet their green credentials. Details of winning schools’ projects and schemes will be printed in a best practice brochure, and distributed to every school in the county to encourage others to follow their lead. The Green School Awards reward efforts in green travel to school and road safety; air pollution, recycling and sustainability; and nature and energy conservation. The event is run in partnership with Golding Vision (part of Golding Homes) and supported by LoopCR, Kent County Council, Medway Council, East Sussex County Council, ADM Computing, EduKit, NCS Technology and KidZania. Winning schools will be presented with their accolades in February at a ceremony staged at Ashford International Hotel.